This article contains information about the Mound Builders culture, their temples, homes and houses. The ancient people of the Mississippian culture of the Mound Builders of North America built large earthen mounds as part of their village complex. 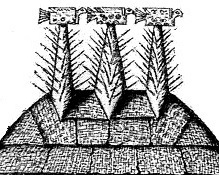 Each village had a mound on which a temple and the chief's house was built. 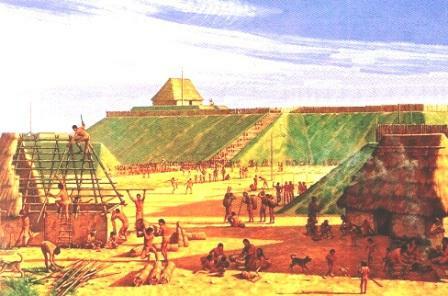 The top of mound was approached by a flight of steps and the temple and chief's house were located at each end of the mound, separated by a plaza. The Mound Builders inhabited many areas across the eastern part of the United States and Canada. The greatest concentrations of mounds are found in the Mississippi and Ohio valleys. The culture of the Mississippian Mound Builders influenced many of the early descendents of the Native Indian tribes including the Caddo, the Natchez and the Creeks who built highly organised villages consisting of grass huts built in the style of the Mound Builders homes. As time passed their housed developed into wattle and daub constructions. The picture shows the Sun Temple and the Chief's house in the Grand Village of the Natchez Native Indian tribe. They were constructed by using a framework of poles and beams covered with wattle and daub. The walls were then covered by cane mats and a thatched grass roof which were carefully clipped and neat. The interior walls were also lined with woven cane mats. The icons displayed on the top of the Sun temple are very curious. They look similar to Piasa and the Great Flying Serpent mythical creatures that featured so strongly in the Mississippian Mound Builders culture. 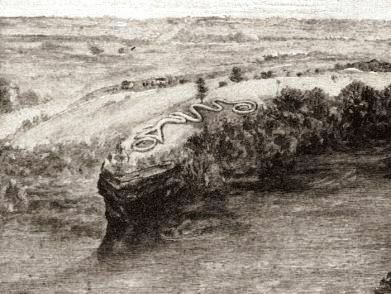 The Mound Builders believed that the Upper world was inhabited by spirit birds and the people of the earth who were ruled by powerful spirits like the Piasa and the Serpent and that the Underworld was inhabited by spirit snakes or serpents. It seems logical that the Sun temple icons would represented the mythical creatures of the other worlds.